Two things keep cropping up during a drive beneath the big blue skies that dominate the vast high plains of New Mexico’s far southeast corner: cattle and pumpjacks. In rugged Lea and Eddy counties, energy production—chiefly, natural gas and oil—as well as livestock ranching have fueled the local economy for generations. Lea County is celebrating its centennial all year long, and a visit to this part of the state offers a glimpse of the self-reliant, pioneer ethos that once prevailed across the West but is in short supply elsewhere today. ROUTE: Start your adventure in Carlsbad with a morning visit to Living Desert State Park. After lunch, drive S. 28 miles via US 62/180 and spend the rest of the day exploring Carlsbad Caverns National Park. The following morning, enjoy a few hours strolling around downtown Carlsbad’s restored waterfront and bustling commercial blocks (find a handcrafted treasure at the Artist Gallery) before driving 70 miles E. on US 62 to Hobbs, home to the lion’s share of the county’s hotels and visitor services. Tour the Western Heritage Museum & Lea County Cowboy Hall of Fame, and then dive into some affordable and authentic Mexican food in the evening. Golfers will want to make time for a round—and lunch in the clubhouse grill or on the patio—at the Rockwind Community Links. The gently priced course ($30 greens fee) has earned numerous accolades in the national golf press. The following day, make the easy 20-mile drive N. on NM 18 to attend the Lea County Fair and explore historic downtown Lovington. OVERNIGHT: Carlsbad’s hotels can book up well in advance in summer with national-parks visitors and oil workers. But a recent lodging boom has eased the pressure, and there are several familiar mid-scale chain properties and economy brands to choose from—as well as two terrific smaller, independent options. The early-20th-century Fiddler’s Inn anchors a charming residential neighborhood at the north end of downtown and offers four art-filled rooms outfitted with 50-inch flat-screen TVs and plush Turkish bathrobes—the latter come in handy when venturing outside for an evening soak in the hot tub. The grand but intimate Trinity Hotel occupies a striking 1890s bank building and contains nine smartly appointed rooms with soaring ceilings and spacious bathrooms. Downstairs, dine on well-crafted Italian food and sample award-winning southern New Mexican wines from Luna Rossa Spirit of Seven Rivers in the high-ceilinged, bi-level restaurant. In Hobbs, you’ll find more than 20 hotels—mostly national chains. Many of the newest and nicest are on the northwest side. A popular independently owned alternative, the 154-room Zia Park Hotel adjoins an expansive entertainment complex that includes a racetrack with live horse racing in the fall, a casino with slot machines, a nightclub, and three restaurants, including the well-regarded Centennial Steakhouse & Pub. Make your way to Living Desert Zoo and Gardens State Park before the sun is fully overhead, as the wild creatures that inhabit this 1,500-acre preserve in the Ocotillo Hills venture out of their dens and enclosures in the cooler hours. Along the 1.3-mile self-guided trail, you can view nearly 50 species native to the Chihuahuan Desert, including javelinas, bald eagles, rattlesnakes, mountain lions, and Mexican wolves. The park’s celebrity resident, a decidedly talented and rather impish-looking black bear named Maggie Oso, paints abstract, brightly colored bookmarks and small paintings—you can buy one in the gift shop. The Succulents of the World exhibit, inside a large greenhouse, brims with entrancingly beautiful cacti and succulents. many with whimsical names—such as Brazilian Old Man and Upright Devil—that reflect their bizarre shapes and features. Drive to Carlsbad Caverns National Park in the afternoon. A smart strategy is to start at the caverns’ natural entrance, hiking the mile-long paved trail, which twists and turns some 800 feet below the surface to the famed Big Room (10 football fields big). If you’re feeling fit, hike back out (you must begin your return trek by 4 p.m.) or ascend by elevator (it operates until 6:30 p.m. in summer; check the website or Facebook page to ensure it’s operational). At dusk, have a seat in the amphitheater overlooking the cave entrance and watch up to a million Mexican free-tailed bats return to their nightly roost. Rangers lead nightly talks during the bat flight, which peaks in August and September. PRO TIPS FOR DINING: The shady brick patio at Blue House Bakery might just be the niftiest perch in town for breakfast. Indulge in an iced mocha or glass of orange-carrot juice, along with spinach-feta croissants, buttery scones, and flaky cinnamon rolls. But come dinnertime, be forewarned: Most restaurants in Carlsbad close by 9 p.m., and it’s a 40-minute drive back from the caverns, so time your departure from the park accordingly. Good bets for dinner include The Trinity and the Lucky Bull Grill, which serves creative pub fare. Milton’s Brewing produces several acclaimed beers. There’s usually a food truck on hand dispensing tasty barbecue, tacos, and other treats. If you make it back to town by 8 p.m., consider catching a movie at the historic Fiesta Drive-In, which opened in 1948. Kick out the morning kinks with a ramble along Carlsbad’s immaculate Pecos River frontage, which is lined with walkways. Then head to Hobbs, one of the state’s fastest-growing cities. (Its population has mushroomed from 28,000 to 38,000 since 2000.) Much of the growth is evident on the north side of town, where you can tour the Western Heritage Museum & Lea County Hall of Fame. Its permanent collection has exhibits on the region’s ranching and oil history, and the Hall of Fame contains a trove of inductee memorabilia, including ornately designed saddles, hats, and photos. The museum also presents about four rotating exhibits annually. Through November 5, Walk a Mile displays the sometimes fashionable, sometimes utilitarian, but always intriguing footwear of notable New Mexicans, including actors Ronnie Cox and Kathy Baker, Washington Redskins quarterback Colt McCoy, dancers from the New Mexico Ballet Company, and speed skier Ross Anderson. Hobbs is blessed with several inexpensive, friendly restaurants serving authentic regional Mexican fare. El Caballero is a family-run, no-frills joint—but the food is fit for a king. Another good bet is the similarly bare-boned El Pollo Chihuahua for rotisserie-style chicken. In the historic seat of Lea County, you’ll encounter numerous restored buildings, including the stately 1930s county courthouse and the art deco Lea Theatre. Some of the structures in the center of town are part of the impressive—and free—Lea County Museum, headquartered in the bright-red-roofed former Commercial Hotel, which went up in 1918. One highlight is an entire room dedicated to legendary Western novelist Max Evans, who spent his early childhood in Lovington. You can tour a number of additional museums nearby, including the 1931 Lister Building, which contains some 20 exhibits on different aspects of the county’s heritage. Highlights include a 1940s airplane, a 19th-century stagecoach, and an art gallery that through September is showing the dramatic images of acclaimed wildlife photographer Gary McAlea. Throughout this year, the museum also presents lectures, music, and films celebrating Lea County’s centennial. Lovington has just a handful of restaurants,but a couple of them stand out for both the food and the ambience. Just across from the courthouse, Cornerstone Cafe turns out expertly brewed coffee drinks plus healthy salads, wraps, and soups, including a hearty and delicious green chile pork posole on Fridays. Filled with vintage bric-a-brac—antique tools, signs, horse tack—Lazy 6 has earned a devoted following for burgers, nachos, fajita chicken salads, and other hearty pub grub. Save room for a slice of fluffy coconut cream pie. In its 82nd year, the Lea County Fair & PRCA Rodeo ranks among the Southwest’s most beloved cowboy congregations. Held just a few blocks east of the historic county court-house at Lovington’s Lea County Fairgrounds, the shindig commences on Friday, August 4, which is also Hispanic Heritage Day. Through Saturday, August 12, agricultural and ranching-related competitions and exhibitions fill each day—everything from a pecan-cooking contest to heifer and swine judging. At five o’clock each evening, festivities kick into high gear, with carnival rides into the wee hours, nightly rodeo competitions, and concerts by top country artists (575-396-8686, leacountyevents.com). 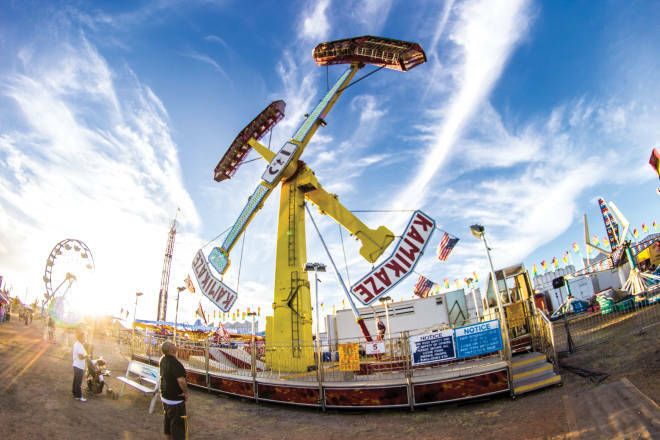 For an appreciation of New Mexico’s myriad county fairs, check out Hog Wild for County Fairs.